Dalhousie University Faculty of Health assistant professor, Dr. Amy Bombay, was among an outstanding group of 17 health researchers who were announced as recipients of the 2018 CIHR Early Career Investigators in Maternal, Reproductive, Child and Youth Health. 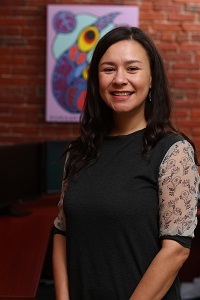 Dr. Bombay received the award for her research project: "Closing the gap: Identifying risk and resilience factors influencing mental health and wellness among First Nations children and youth." Yesterday the Honourable Ginette Petitpas Taylor announced nearly $1.7 million from the Government of Canada, through the Canadian Institutes of Health Research, to support the work of the early career investigators who will conduct research projects that may have a significant impact on maternal, reproductive, child and youth health. “We’re committed to investing in research that will improve the health of Canadian families. These researchers will help solve health problems facing parents and children and play a role in creating a healthier future for Canadians,” she said. Other projects include a wide range of topics from addressing insomnia during pregnancy, through supporting children with motor difficulties. CIHR-IHDCYH in partnership with the Institute of Indigenous Peoples' Health (IIPH); Institute of Circulatory and Respiratory Health (ICRH); Institute of Health Services and Policy Research (IHSPR); Institute of Infection and Immunity (III); Institute of Musculoskeletal Health and Arthritis (IMHA); and Institute of Neurosciences, Mental Health and Addiction (INMHA) announced the recipients of the 2018 CIHR Early Career Investigators in Maternal, Reproductive, Child and Youth Health on March 11, 2019. Dr. Bombay has appointments with the Dal Faculties of Health (Nursing) and Medicine (Psychiatry).